Fellow foodblogging friend, Jeanne of Cooksister in London is hosting a foodblogging event today called "Waiter, there's something in my..." that requires participants to make a pie. Any kind of pie, as long as it is 'covered'. Over here in San Francisco, even Sandra Lee would be hard pressed to put as little effort into pie making as I do. The recipe is simple: All it takes is a trip to the Ferry Plaza Farmers' Market where I can pick up a delicious handmade, artisinal chicken and mushroom Mystipie for $6. I then rush it home to a preheated oven, where I settle it to heat for 20 minutes. This is cooking at its easiest folks! The impressive result of all my hard work in the kitchen is a warm crispy mass of buttery, flaky pastry, encasing a creamy filling of chicken and mushroom, that shatters, crumbles and crunches as I hurry to eat it. It's a few minutes of messy, mouthwatering fun. To be honest, what's inside the pie is of little consequence here, so overshadowed is it by the tower of light, crispy leaves that hide it from view. The Vegetable Coconut Curry pies have a great flavour, but I prefer some texture and bite in the middle of my pie, so I tend to go for the meat ones instead. The filling is just a vehicle for pastry, anyway and that's the allure. I don't have much patience for making flaky pastry, so I am lucky I have found Yumna who will do it for me. "The smell of pies always reminds me of home. My fondest memory is waking to the delicious aroma of freshly baked beef pies wafting through the house. I still think of my mum every time I smell pies baking." Thankfully for all of us San Franciscans, Yumna stopped getting homesick, but because everyone she knew loved them so much, she kept on making the pies that had given her so much comfort. One friend even described them as a 'warm hug' which perfectly sums up their attraction. Mystipies are available at the La Cocina stall on Saturdays at the Ferry Plaza, at the Alemany Farmers' Market or at Mission Pies. I stopped by on saturday for the vegetable coconut pie but they were out....haven't tried yet but they look and sound delicious.....you're making me hungry - i'm off for breakfast. Great entry! I hope to make it to the market when I come visit SF at the end of March. It looks like a great time! Reminds me of an Australian pastie. Different filling though. I love them with lots of tomato sauce. Yum. That pie looks delicious, my mouth is watering, must go and have breakfast. This is my first time to your blog. I came here... via... oh now I can't remember. Anyway I've got a total blog crush starting here! I can't wait to come back when I have more time and look around your recipes. I've just started taking pictures of the things I cook and posting recipes. It could become an addiction I do believe. I've never understood why some people are so enthusiastic about textural qualities like "crispy" and "flaky" and "crumbly". Especially since flaky and crumbly are so messy to eat. How much pleasure can you get from textures? I'm all about flavor. beccy - still on a health kick? rachael - yes, big fat cheater. vicki - thanks - I will stop by and see you. sheila - there was a flavour too - I called it "buttery" and I happen to like buttery and flaky in the same mouthful. Sorry you are not able to take the same pleasure from it. This is what I might consider mild and easy eating, a comfort food, which I can enjoy just as much as other more intense flavours at different meals. Thanks for the tip - I'll check it out next time I'm at the farmer's market. 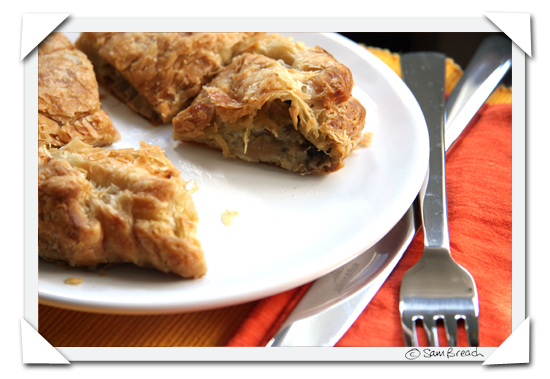 *gasp* - and you come over to my blog to comment on how *I* cheated with ready-made pastry?? At least I started off with raw ingredients :o) It's spatulas at dawn - choose your weapons and bring your seconds!! Back in the real word, I will let this one go, just because you are promoting another fabulous South African foodie abroad ;-) So despite your cheatin' ways, you'll be in the roundup. Thanks for playing!